Government is planning to take an action against migration from hills. Many people are migrating from hills, they have find a better life and lots of opportunities in cities. Now government have decided to open 10 Industrial Training Institute in different hills of Uttarakhand. So for encourage people to stay in hills government will provide resource so that youth can learn from those institute and develop skills and self employment. Hills are very tough for living. For future prospect in hills there is no growth and skills. Youth are diverting from there to a metro city to get a bright future. So Uttarakhand Government have took an action to stop the migration. 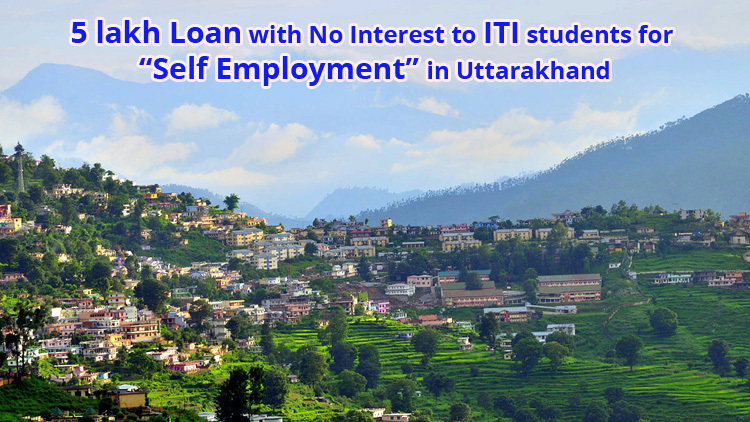 Government would give 5 lakh loan to ITI student for starting their own bussiness in related field. Interest on loan will be given by State Government. It is a golden opportunity for Uttarakhand youth. They can now enhance their skills and use it for the development of Uttarakhand. CM, Harish Rawat said "As putting an end to migration is one of the main challenges before us, this initiative will contribute to check this problem in a big way,". Rawat said that government would provide good training and practice through ITI’s institutes and youth can work according to their skills. Governments have lots of plans for the development of Uttarakhand hills, this is a begining, after it’s execution government will take some certain and necessary step for Agriculture and Horticulture. Uttarakhand have lands, full of minerals, so to support agriculture and horticulture will prove beneficial in future. Help us to improve this article/job posting "5 lakh Loan with No Interest to ITI student for Self Employment". We would be glad if you can comment below and provide your valuable suggestions and feedback. If this page have any wrong information/list or out of context content, then you can report us as well. sir i m interested with this iti student loan scheme.plz help me for this apply. I want loan I compleat the copa trade. sir plz tell me about for this loan scheme…..
5 lakh loan please sir i am machinist trade iti gov. Sir, I’ve to Complete ITI with 4 semester. Trade with IT & ESM. I’m Interesting This Offer with my skill. I want to minimum 2Lakh maximum 4Lakh Loan for my Business. I’m opening computer,printer seals n service shop Name of sai multination if u give me this loan. i wan to apply for loan as i have done a diploma with Computer Operator and Programming assistent from ITI Rajgarh Distt. Sirmour HP. Dear sir i’m ITI holder and i was required to 5 lakhs for shop loan. Dear Sir I’m complete in ITI in plumber. I want 5 lakh loan for shop. Please sir give the loan. I have Completing Diploma at 2014. I need a 5 lacs Loan of Government.Help In This Progress of Succes This Loan…Help mE.. I have completed in ITI at Salem govt ITI. I need to Loan in self employment, so how to get the loan .kindly request you to forward the loan details.Location for Salem district. Sir I HV passed ncvt iti in electrical trade with +2 science qualification from 2001. But I HV no job till date.. I want a self employment. And how is possible kindly guide me sir. And m from odisha..
Self-employment for a. +2 science with NCVT ITI ELECTRICAL …. Now I am planing I have do small business I want loan to dodo business thanks you. dear sir i am iti student i have apply for loan bussines.please give some suggestions . I am student of ITI and my trade is COPA. I want to take a loan for self employment so, tell me all the procedure please. PLEASE HELP ME I AM INTERESTED THIS LOAN. I am interested this loan i am passed govt ITI in fitter trade. Now i am planing i have starting in small business in our city. Fake post.They don’t even reply. for.loan i have completed my ITI with Turner.. I am a unemployed person now I want to start my own business for which I need the loan. I have completed my Fitter course from Nagaon ITI. ( Assam). The loan will help to establish my self. I am completed ITI. I have one year working experience of wheel alignment balance. I wish to start a own shop. So kindly help me sir. Many 2007 may NCVT ITI FITTER ( 77%) mark ki saat pass kia ho,unka alaba CNC(EDM-WEDM) Kia ho.5 saal fabrication kam ka experience hay,6-7 saal ka khood ka agricultural equipment products manufacturing workshop salarahaho ,10 say 20 lakh khood ka invest hay Lakin muje 1 crore rupees lahiya,Kia a sombob hay? I am completed ITI. Ncvt plus I have one year working experience of wheel alignment balance. I wish to start a own shop. So kindly help me sir. Sir, I want to starup ..
Dear sir/madam,I have completed ITI(Motor mechanic vehicle),NCTVT,&,DIPLOMA in Artisen to Technocraft in Automobile. I have 15years working exprince in automobile sector-Repairing & servicing. I want to loan for my own buissness. So please tell me procedures & documents for loan. Dear sir I am iti fitter student I want loan 5 lakh because I will open my own business please help me my contact no 8310261120,8123116382.
sir , i completed iti in computer operator & programming assistant . i want to get loan for start a new computer education center. My name is khushal parmanand adwani.my state is Gujarat.i have applied is lon for business.